Last October we visited Hackney Downs and came across a vodka distillery being built in a railway arch – hopefully it is finished now, so time for a revisit? Even though we’ve cold-called, Jack and Matt at Our London Vodka invite us in to their brand-spanking new premises and show us around. The distilling arch is full of stainless-steel tanks with reflections etc., so a great backdrop for monochrome work using the Pentax 67 on a tripod. As we are in the area we also revisit Dog Villas on Bohemia Place – why won’t those dogs sit still?! Phoebe poses gracefully along with (only) some of the dogs! Just along the arches, the lads at Pressure Drop Brewing are sitting outside their arch having lunch in the early spring sunshine. A perfect scene... not all my shots need to be of people actually working. This is life in the railway arches. Next off on the bus to the Mile End/Bow Common area, and a long stretch of arches here. At Laura Kuy Flowers, Rebecca and Catherine are arranging hi-end flowers for hi-end hotels in London. Almost next door Steven and his team at SYFM Furnishings are busy making curtains and upholstery for more hi-end clients – Russian oligarchs! We’ve seen many auto servicing arches on our travels, but this is one that ticks my box. Paul at Prestige Autocare smiles as he leans into the back of a Porsche he is servicing. Great shot! At the very end of this stretch, nearly at Bow Triangle, we come across a really interesting artisans arch. Mark is making his bespoke furniture and Darcy, inventor/designer, is at his workbench – his many tools lined up on the wall above him. These two guys, for me, typify the diversity of the arches today: a complete contrast from the gentrified offices in Wootton Street at Waterloo East, say, but this is what my Under Tracks project is all about. Over a cup of tea we chat away, and photograph Mark and Darcy at work in their homely surroundings. A great ending to a great days work. The engine's in the boot! Paul and a Porsche at Prestige Autocare. It is the first bright Friday of the year as we set off again into uncharted territory from Camden Road station. Near the station on Randolph Street, we find a guy painting what look like garden screens. It turns out these are high-end props for events, and this is the workshop arch for By Appointment Only Design – a flower shop in Chiltern Street W1 who provide a flower service for wedding and event planning. A few streets away in Prowse Place the arches are 21st-century plate glass. Here is the smart furniture showroom of Warren Evans. I recognise the logo from their ads in the Sunday colour supplements. As we turn north across Hawley Street we start to smell cooking. It turns out to be the aroma of chocolate. 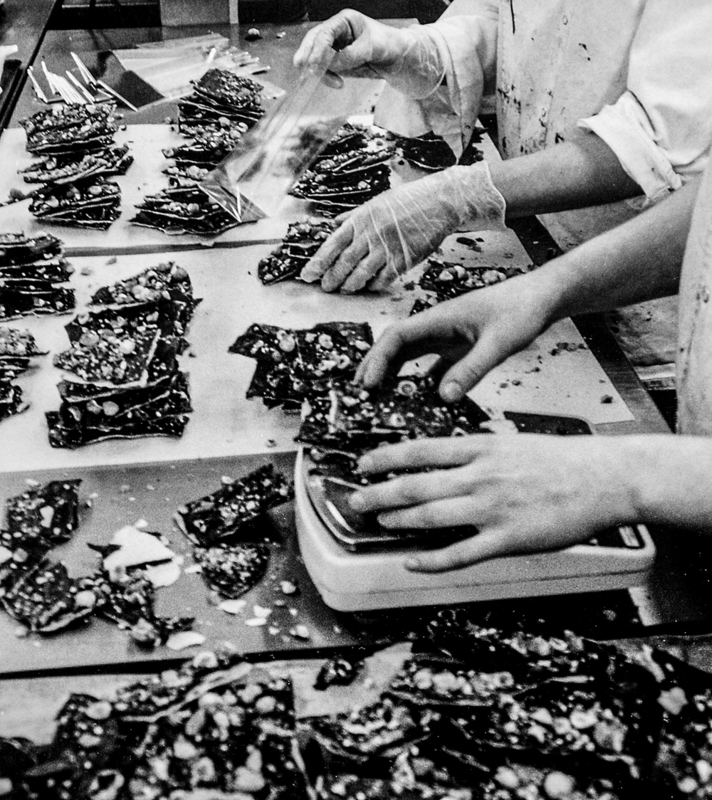 In a series of arches belonging to Yotam Ottolenghi (one of our favourite chefs) are Javed, Agnieszka, Maite and Colleen busy preparing Chocolate Crunch for Yotam’s restaurants. I take many shots here, including some of Yotam tasting one of his creations. Just above Kentish Town West station we detect another aroma, but this time it is the smell of hops. These are the many arches of the Camden Town Brewery, and I’m able to record Kayleigh and Paul working, preparing a trial beer. The daylight hours are still quite short in February, but in Wilkin Street Mews, Lunar Cycles have a workshop arch. 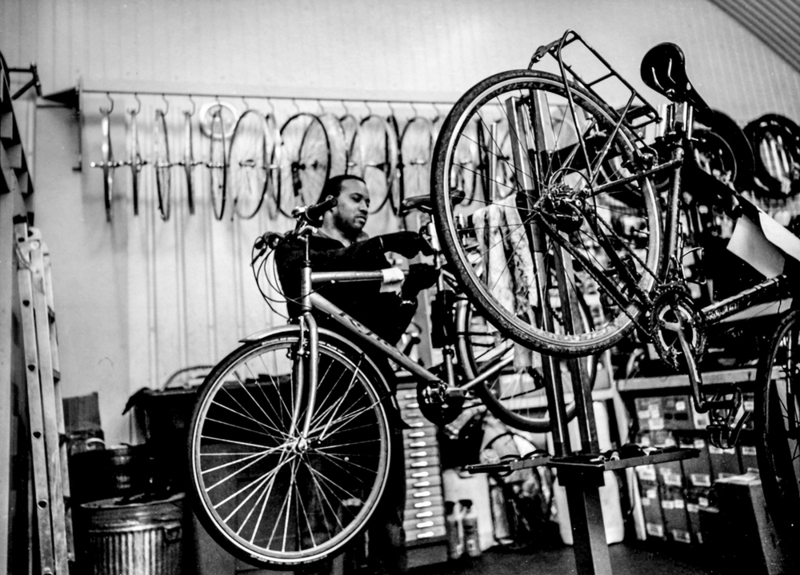 Using the Pentax 67, I capture Derlon servicing a bike – the perfect ‘model’ for my last shot of a long day.